Not for the first time, hopes are building that the UK government is on the verge of agreeing a Brexit deal. Press reports towards the end of last week had suggested the Prime Minister was preparing to gather her Cabinet to approve a compromise on the contentious Irish backstop, potentially unlocking an ad-hoc EU summit to sign it all off later in November. But that now looks less likely. The surprise resignation of Jo Johnson, Minister for London, as well as various stories in the weekend press indicate that many key members of May's team remain sceptical about what the deal might involve. But even if, in the end, ministers are convinced to accept the mooted fudge on the Irish border, the question of whether MPs will vote for it in Parliament is just as uncertain as ever. And while Brussels appears keen to get a deal wrapped up, the multitude of practical challenges associated with the UK-wide customs arrangement being proposed as part of the Irish backstop, could easily see talks drag on beyond November. While nobody really knows when a deal might be agreed & approved, we still think there is a risk that it might not be until much closer to the UK’s exit date in March, that we find out whether ‘no deal’ has been truly avoided. So while the Bank of England has signalled it wants to carry on tightening - particularly in light of recent momentum in wage growth - we don't expect policymakers to hike until May 2019 at the earliest, assuming of course that a deal is signed and sealed. Away from Brexit, it's also a packed week for UK data and as is increasingly the case, wage growth will be front-and-centre. At 3.1%, regular pay in the UK is now growing at the fastest rate since 2009 and we expect it to stay at this multi-year high again in Tuesday's data. This trend has been central to the Bank of England's rate hike rationale and is being driven by intensifying skill shortages across the economy. According to the government's latest Employer Skills Survey, these shortages are most acute in the construction, hotel/restaurant and IT sectors (see chart below). 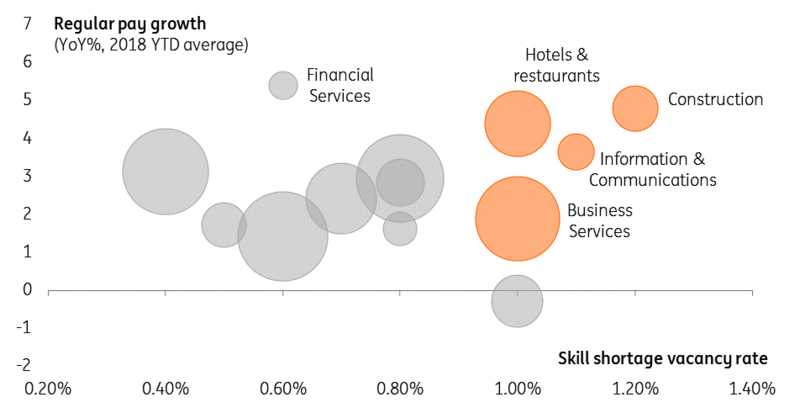 All of these industries have seen the pace of wage growth pick-up over the course of 2018, as firms are forced to lift pay in a bid to attract staff. 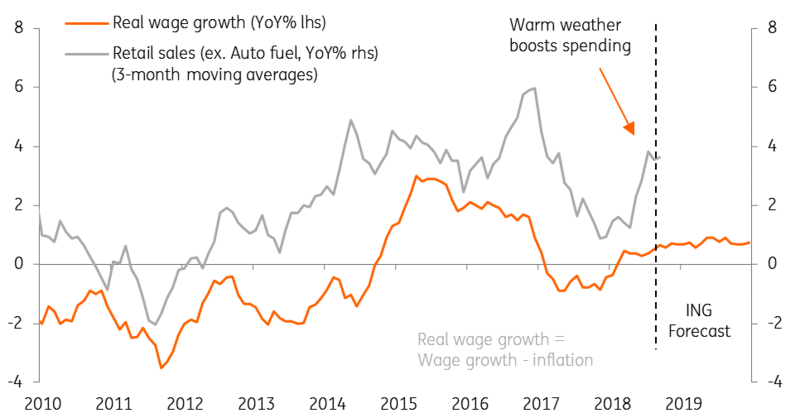 Admittedly we don't think wage growth will break much further above 3% over recent months (and in fact, the latest 3.1% level may represent a peak). But overall, we think this story is likely to stay with us as we head into 2019. Size of bubble is proportional to number of people employed in that sector. Manufacturing, primary sector and business services wage growth calculated as weighted average of earnings in sub-industries. Having said that, it's not all rosy in the jobs market at the moment. According to the latest few official readings, hiring ground to a complete halt over the summer. While this may just be a short-term aberration, we suspect some of this is down to firms putting the brakes on hiring decisions as the perceived risk of a 'no deal' Brexit has risen. 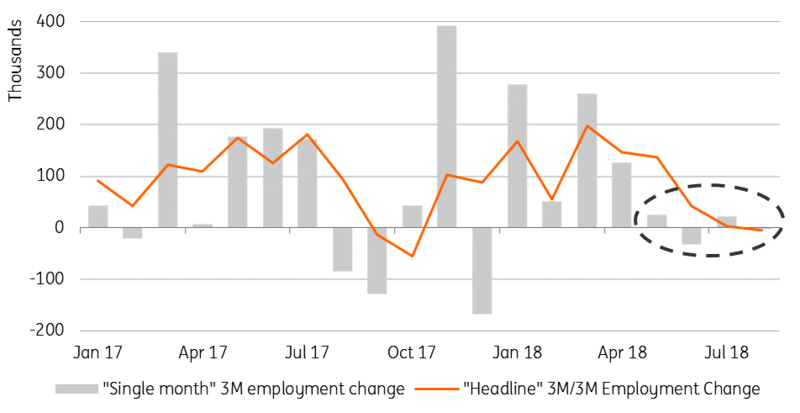 We may see a small rebound in employment this week (we aren't convinced the story is quite as weak as the last few readings make out), but, nonetheless, the underlying trend is likely to persist until firms know for sure that 'no deal' has been averted. If Brexit negotiations or the crunch Parliamentary vote slip into next year (which despite the more encouraging newsflow, is still a clear risk), we may see firms become more vocal about the risk to jobs if the UK were to crash of the EU on WTO terms. In this case, there is a risk we may see consumers cut back on spending a little further in the short-term if concerns about job security build. The noticeable rise in petrol prices since March has stalled the decline in headline inflation, and we expect CPI to remain unchanged at 2.4% this week. 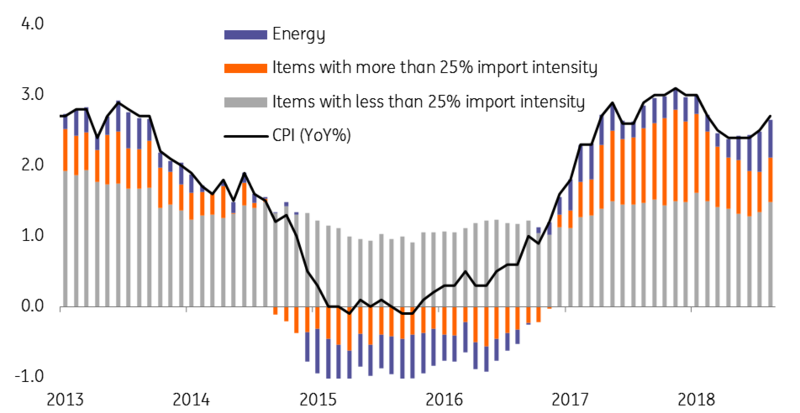 But we anticipate the energy effect will gradually fade as we move into 2019, and now that the pound's post-Brexit plunge has largely filtered through to prices, headline inflation is likely to slip back to the 2% target by the second quarter of next year. In principle, that might take some pressure of policymakers to hike rates again in the Spring. But as we noted above, all the focus is on wage growth and the Bank is pinning its hopes on this translating into more intense consumer price pressure across the medium-term. The strong third-quarter growth figure last week confirmed that consumers were in a buoyant mood over the summer, at least during the warmer stages. However, now that the sunny weather is behind us we think retailers face a big test over the Christmas period. While wage growth has risen, the higher petrol prices have kept a lid on disposable incomes. Consumers remain cautious about the general economic outlook, and there is a risk this sentiment deteriorates further as 'no deal' warnings mount. There's also some limited evidence from the Bank of England's recent credit survey that the summer spending splurge was partly fuelled by higher credit card spending, which can't last forever. That said, we expect a rebound in retail sales on Thursday, although we think this would say more about the recent volatility in the data than anything fundamental.